Mystery Mike Hennessey has been the owner and operator of Mysteries By Mike (www.mysteriesbymike.com) for over 12 years now. 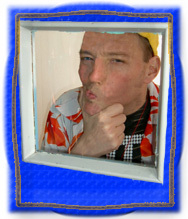 His company provides interactive, educational mystery shows that use riddle and clues to teach children to read, write, spell, count, team work and so much more. To date, he has written, produced and acted in over 10,000 shows for over 250,000 children throughout the country, writing a total of more than 125,000 riddles. He has created numerous tv shows for children and has written a number of children's books as well. Mystery Mike is so excited to be returning to the Summer Art Academy and bringing his unique and famous "Secret Agent Training" and "Treasure Pirates Training" courses. He looks forward to entertaining while educating your children as they have a wacky, fun and enlightening experience this coming Spring Break.